ROEE ROSEN (b. 1963) is a filmmaker and writer. His films include “Out” (2010), which won the Orizzonti awards for best medium length film at the Venice Film Festival. His latest book is entitled Live and Die as Eva Braun and Other Intimate Stories (Sternberg Press, 2017). His art is featured this year in Documenta 14. Rosen is a professor at Ha'Midrasha Art College, and at the Bezalel Art Academy, both in Israel. 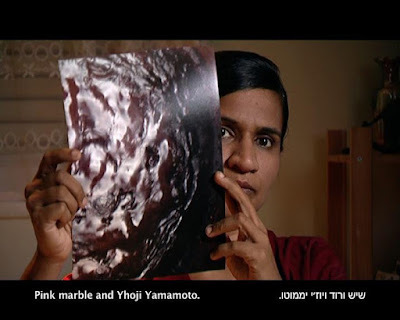 Roee will screen an excerpt from his cinematic project The Confessions of Roee Rosen (2008), and speak to the piece, where the artist's supposed confessions are delivered in Hebrew by three surrogates: illegal female foreign workers who do not understand the language. Confessions premiered at the FIDMarseille festival, where it won a special mention, and was later shown worldwide, among other places at Manifesta 7, in Italy. CATHERINE THEIS’ latest book, MEDEA (Plays Inverse, 2017) is an adaptation of the Euripides story. Her first book of poems is The Fraud of Good Sleep (Salt Modern Poets, 2011), followed by her chapbook, The June Cuckold, a tragedy in verse (Convulsive, 2012). Her interests primarily focus on the intersection between translation, poetics, and performance studies. Catherine will read from MEDEA, but also read part of an essay she wrote about tragic performances. She intends to play with time. MATVEI YANKELEVICH's books include the long poem Some Worlds for Dr. Vogt (Black Square), a poetry collection, Alpha Donut (United Artists), and a novella in fragments, Boris by the Sea (Octopus). His translations include Today I Wrote Nothing: The Selected Writings of Daniil Kharms (Overlook), and (with Eugene Ostashevsky) Alexander Vvedensky's An Invitation for Me to Think (NYRB Poets). He is a founding editor of Ugly Duckling Presse, and teaches at Columbia University's School of the Arts and the Milton Avery Graduate School of the Arts at Bard College. Matvei will present "Fact's Folly," a 10 minute piece that draws on early soviet documentary film and theory, written in response to a photo-sequence ("Ship of Theseus," by photographer Hannah Whitaker) which will be shown as a video montage. In addition, he will read poems from a cycle-in-progress called "From a Winter Notebook."